Only yesterday we saw an array of renders of the expected Huawei Mate 10 made with factory CAD and dimensions data and today we see the first alleged live picture of the device. 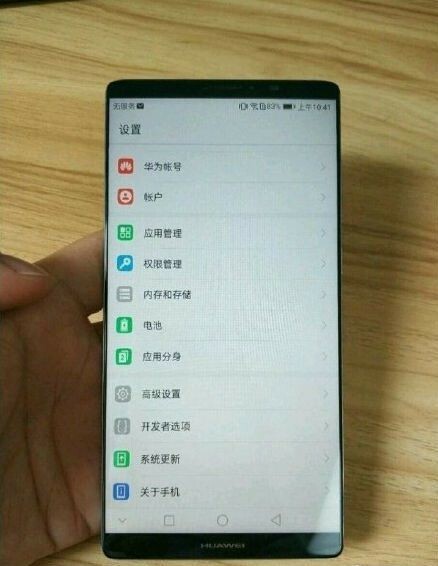 The picture, shown below, reportedly contains the Huawei Mate 10 with its edge-to-edge display and button-less front. Interestingly the renders showed a button, but that's not to be seen here. Given that the Huawei Mate 9 had no physical controls on the front this image may very well be genuine. We've also heard talk of regular and Pro versions of the Mate 10, so we might have seen two different devices. What we know so far is that the Huawei Mate 10 will be showcased in Munich on October 16. It will be powered by Huawei's own Kirin 970. We have also heard it will have a 6.3-inch IPS LCD of 1440x2960px, 6GB of RAM, 4,000mAh battery and a dual 20MP+12MP snapper on the back.